Have you heard of The Lusty Vegan? all-round an excellent thing to have on your shelf. Are you guys sick of me posting about the recipes I’m trying from cookbooks yet? Yes? No? Well we’re only on week two so you’ve still got a solid next two weeks of vegan cookbook love happening so GET READY FOLKS. More vegan goodness to be had! This is one of my new favourite cookbooks. I love reading cookbooks like they’re books because there’s insight on what goes on in the recipe developer’s mind—how they came up with the recipe, why they like a recipe, what ingredients they tend to go for. What I’ve learned from The Lusty Vegan is that Ayinde, one of the authors who is a vegan chef (who grew up vegan! ), loves his Old Bay Seasoning, red bell peppers, grapeseed oil, tofu, tempeh, and big booty. Yes, he mentioned that he likes big booty in the book. What I’ve learned from Zoë, the other author, is that you shouldn’t manipulate people into becoming vegan, because it never works in your favour, and that she is a big fan of a good ol’ roll in the hay. The tone of the cookbook is very conversational and friendly. You learn from Ayinde’s and Zoë’s experiences (good and bad) from dating as a vegan and what they’ve found out as vegans who date omnivores. I’ve only been vegan for two years and I’ve dated two omnivores who had very different reactions to my veganism. One was very defensive and not the most supportive about it, the other is really chill and extremely supportive of it. Each chapter serves as a very informative chapter (I like to think that Burrito Boy found the Omni on Vegan chapter very helpful) paired with some delicious, well written recipes. I’ve edited a lot of chef-written recipes before and boy, they can be rough. Ayinde’s recipes are clear, thorough, and a feast for the eyes. I learned a lot about patience, what not to do, and what to expect of a partner—although these are also things I’m learning day-to-day thanks to Burrito Boy. Basically be respectful, don’t expect your partner to be vegan, and don’t judge them for their choices. But Ayinde and Zoë explain it much more thoroughly and eloquently so you should just go ahead and get it. 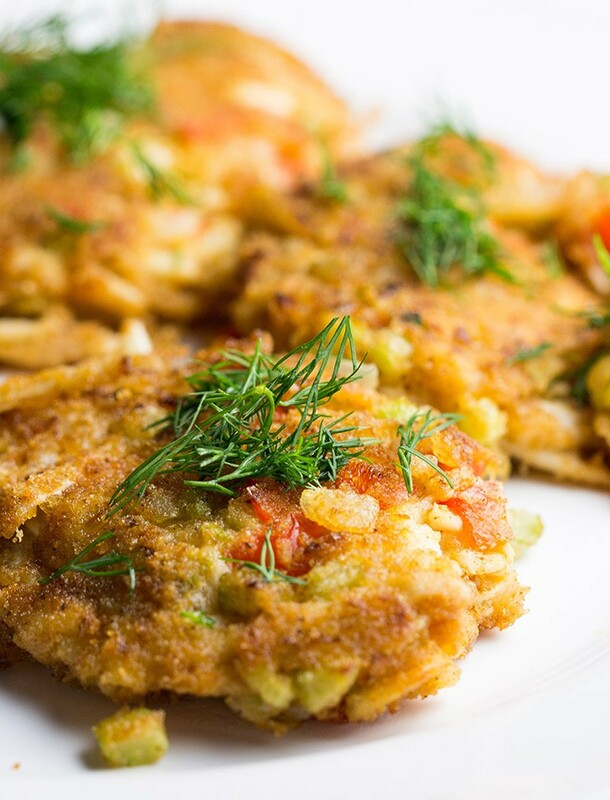 Vegan crab cakes! And vegan lobster rolls! Essentially the same recipe but tweaked to be breaded or stuffed into a hoagie roll. I’ve heard of jackfruit being used as a seafood/meat replacement, but I only discovered hearts of palm a couple years ago and was really curious as to how it would translate into a savoury mock-seafood recipe. I am on the hearts of palm train. At first I wasn’t sure how to “roughly chop” hearts of palm to match the texture of crabmeat, but I ended up cutting the hearts of palm shoots into three pieces, halved them, and then tore them a little bit with my fingers. You could cut them but I wanted the torn, meaty texture of crabmeat, and chopping them didn’t satisfy that for me. I’m sure the recipe would be just fine if you chopped them, but I was going all out here. The tender texture of hearts of palm brings me back to my childhood Vietnamese giant BBQ days where probably hundreds of crabs were baked and slathered with whatever seasoning my mom uses. Even back then I was reluctant about killing live crabs and lobsters, I should have known I would end up vegan when it came to deciding on what lives or dies to be on my plate. But anyway, I digress. Ayinde’s recipes for the lobster rolls and the crabcakes were PHENOMENAL. I tracked down a tin of Old Bay seasoning at a local fish market and baffled the owner’s mind when I only wanted the seasoning and none of their seafood. Old Bay seasoning adds that taste of spice, sweetness, and tang that goes perfectly well with tender hearts of palm. The crunch of the celery and red peppers were fantastic, and a squeeze of fresh lemon just made this an epic meal. 9/10 would eat again. Okay, so if I had to choose between waffles and pancakes, I choose waffles hands down. But something about these pancakes caught my eye, and I tried them the first time I had a chance. They were SUPER thick and almost biscuit-like but they were unbelievably fluffy with a lightly crisp outside. The crisp edges and tender centres were the perfect contrast and yielded the best maple-syrup sponges ever. It wasn’t so saturated with maple syrup that it was too sweet, but they maintained a fantastic texture even when soaked up with the perfect amount of maple syrup. I tweaked the recipe by adding a splash more of soy milk because they were too thick to really shape properly, but 10/10 would eat again. YES, THAT’S RIGHT. A 10. Am I abusing the caps lock a little bit? Maybe? But I’m feeling emphatic today. I ended up making this recipe three times because it was so good. The first time with just maple syrup, the second with maple syrup and blueberry-cranberry sauce, and the third time with haskapa maple syrup. All three times, super delicious. And they made just the right amount for two people. I also learned that if you heat up the water before you add Ener-G egg-replacer powder, you’ll whisk up a thick and gooey mixture that adds more of a binding eggy texture than it would had you not heated it. I HAD NO IDEA. SCIENCE, AMIRITE?! It makes sense, but I don’t recall this ever been on the box, which has long since been discarded. So yes, in retrospect, I only made three recipes, two of which were very similar so I don’t think I got an accurate idea of what the recipes were like. But, I plan on making the jambalaya tomorrow (it looks crazy good), and I bought two bricks of tempeh to try the Kung Pao Tempeh because I foresee myself making it twice. I also had the opportunity to interview Zoë and Ayinde for this post, but this month I’m sort of flying by the seat of my pants, so that didn’t work out on my end, but maaaaybe I’ll hit them up for a future post about vegan-omni love (since I write about it so often here anyway). Want to win a copy of The Lusty Vegan? 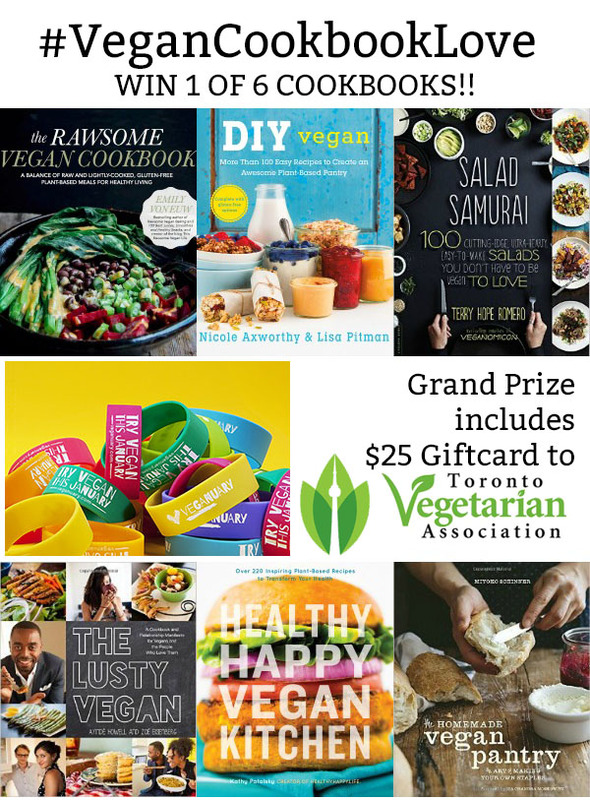 Then you should probably enter this fantastical vegan cookbook giveaway thanks to the Toronto Vegetarian Association (TVA), Emily Von Euw (This Rawsome Vegan Life) and Kathy Patalsky (Happy. Healthy. Life). 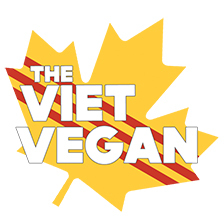 If you’ve never heard of the Toronto Vegetarian Association, you should scoot on over to their website and have a read. When I first moved to Toronto, I wanted to get involved with the community and make more friends, so I joined the TVA as a volunteer. I met some fantastic people, learned tons about veganism and how easy veganism can be, and joined in on some really fun events. It’s a non-profit charity that seeks to educate people about vegetarianism and provide resources to help people make a difference in their lives and the lives of animals. If you live in the Toronto area, they also have a Veg Discount Card that has partnered with hundreds of businesses and restaurants in the Greater Toronto Area to give discounts and benefits to members of the TVA. Become a member and get your discount card, I use it all the time to get sweet sweet deals on vegan takeout and goodies from some of my favourite health food stores. While you’re at it, you should check out my friends Joann and Trish who joined me on this #VeganCookbookLove project. 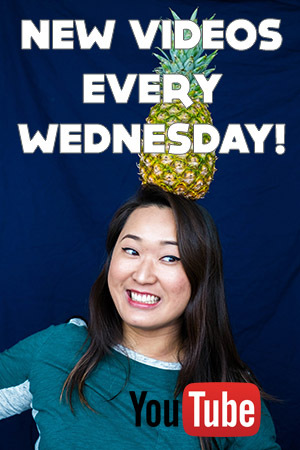 This week they featured Salad Samurai on Woman in Real Life and Mastering the Art of Vegan Cooking on infinebalance blog! The Homemade Vegan Pantry + $25 gift card you can use at the TVA Resource Centre (where I volunteer twice a month!). There you can find TONS of vegan cookbooks, DVDS, and other books about how to rock on and be plant-based. Not only that, but Veganuary sent me a TON of awesome wristbands that I’ll be adding to each prize for people to show of that they went vegan for January! Share with a friend, show off how awesome you are for eating vegan (even if it’s just for a month! ), and be rad. Last but not least, cook along with us and use the #VeganCookbookLove hashtag on Instagram! Tag the vegan cookbook authors and give some love to those hardworking recipe developers. Sometimes I forget how hard it is to write a cookbook. One day, my own cookbook will be alongside these fantastic cookbooks, but in the meantime, let’s get cookin! if you’re Canadian using Amazon. Thanks for supporting TVV and helping me fund my passion!